I have been looking around for a good yet simple customer relationship manager to use and couldn’t find what I was looking for. 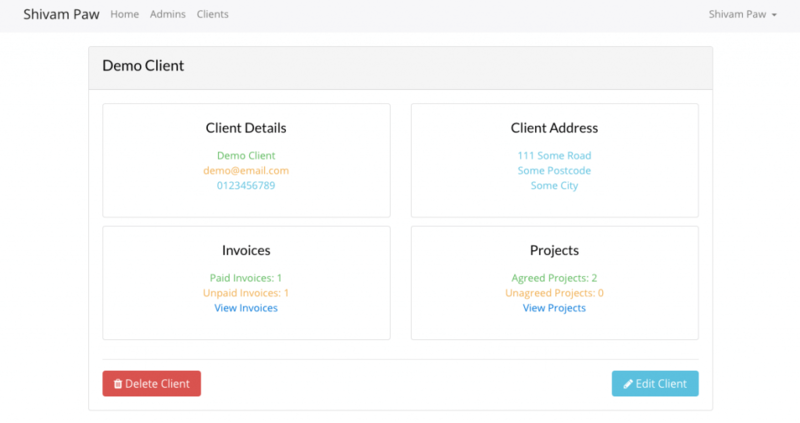 I wanted a CRM where I could add clients, assign projects to those clients and then also create invoices which can optionally be assigned to a specific project. I also wanted clients to be able to pay invoices through the web application securely. Oh well, if you can’t find it, so why not make it? I decided to use the PHP Laravel Framework to start with. It is my go to framework for PHP web applications. I also decided that I want to keep the project as open source so I decided to make it a repo on my GitHub profile. This way, other developers can contribute to it, reports issues and it can be made into something a lot bigger and better! You can checkout the repo here. Easy install, you need to run a few commands and it will create a super admin for you. A super admin is an admin with the ID of 1. The super admin can create and manage admins. Admins can create and manage clients. Admins can create projects for clients. Projects have a title and a PDF file where the admin can attach the full project details. Admins can create invoices for clients. Invoices can have unlimited items and an optional notes section. Invoices can also optionally be linked to a project. Clients can view their projects and invoices. Clients can mark a project as “agreed”. This can be used as proof that the client accepts any terms and conditions. Clients can pay an invoice using the web application. Once paid they are sent a receipt and confirmation email via email. Clients get emails when a new invoice is generated and a new project is created. The PDF file is also attached to the new project email. Emails sent when new accounts are created. Those are the main features I have implemented in this customer relationship manager. Many more will come and if you have any suggestions then be sure to let me know! I used Bootstrap 4 for the frontend design. Bootstrap 4 is currently (21st November 2016) in alpha so there will definitely be changes as it moves along into beta and stable releases.